Cancer is one of those diseases that can strike at any time, and anyone. Some people who are fit and healthy get cancer, while some who have led a sedentary and less healthy lifestyle never get cancer. There are many complex processes that lead to cancer and this is why nobody is really ever 100% safe from ever getting struck down by this dreaded disease. However, there are a few ways you can reduce your chances: Exercise, follow a healthy diet, avoid pollutants and toxic chemicals as much as possible and take a good antioxidant and vitamin D.
In 1931, German scientist, Dr Otto Warburg won the Nobel Prize. 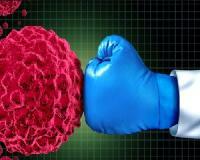 He discovered that cancer cells have a much faster metabolism than healthy cells. They need more energy to support their rapid dividing. Like normal cells, they get this energy from glucose. But, Warburg showed that cancer cells can use glucose ten to 50 times faster than normal cells. This huge consumption of glucose is what fuels the explosive growth of cancer. In other words, sugar feeds cancer. And a high-glycaemic diet is like throwing fuel on the fire. This was confirmed by The Women’s Health Study which showed that a high glycaemic diet raises the risk of colon cancer in women. Other studies link a broad range of cancers to high insulin levels. The best way to keep insulin and blood sugar stable is a low-glycaemic diet. Avoid refined carbohydrates (anything processed) and eat lots of vegetables, leafy greens, and whole fruits. But avoid fruit juices that can spike your blood sugar. By reducing sugar and refined carbs, you will help prevent and slow cancer cells from developing. In a recent study, published in Biochemistry and Biophysical Research Communications, it was shown to be 400 times more effective than metformin in improving insulin sensitivity and helping reverse type 2 diabetes. * Reduce chronic inflammation that causes insulin resistance which leads to type 2 diabetes. * It's a powerful antioxidant and anti-inflammatory which prevents and stops cancer in its tracks. * Treats joint pain and relieves pain. And many studies are showing that curcumin is doing all this, often, better than pharmaceutical drugs, and without any harmful side-effects. A higher demand for glucose is not the only difference between cancer cells and healthy cells. Cancer thrives in an oxygen-starved environment. Healthy cells thrive in one that is oxygen-rich. Cancer also likes acidity. Healthy cells do best in a slightly alkaline environment. The great news is that a diet that makes your body more alkaline will also make it more oxygen rich. Do this by eating plenty of raw vegetables, fruits, berries, superfoods, and other healthy foods. Another way to increase oxygen to your cells is to exercise. By following these healthy habits, you will create an environment where cancer cannot exist. Your super immune system will quickly remove abnormal cells. Antioxidants will extinguish free radicals as they form and healthy cells will thrive.